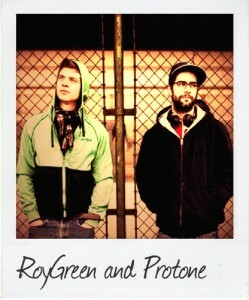 Thomas Mondel and Mathias Rauter, better known as RoyGreen & Protone, are two drum & bass producers from Austria. They first met in August 2010 at Vienna’s infamous Flex Club and quickly began producing as a duo. With forthcoming releases on Soundtrax, Innerground, Liquid V, Rubik, Intrigue, Demand Records and many more, 2013 is shaping up to be a big year. RoyGreen: I’m from a small town called Klosterneuburg just outside of Vienna, where I currently live and eat. Protone: I’m originally from a small village called Villach in the southern part of Austria. Born and raised next to sheep, but I moved to Vienna five years ago to study here. RoyGreen: Our approach to making music is quite simple; we tend to produce as we feel. We think this gives us a widespread variety from deep and mystical to uplifting and soulful. We like to draw outside of the box! Protone: Creating music is like creating a vibe and a feeling. Apart from drum & bass, we mainly enjoy listening to the smoother vibes such as jazz, hip hop, soul and funk, which are often the genres where we find our samples. Although, overall there is really no set method to our madness!